I was interested to read two very different policies from two rival chess retailing websites recently. It was in relation to the kind of boards they stocked. The first retailer makes quite a big deal about how all of their chess boards are made out of solid wood, no veneers present! They point out the benefits of having a solid board as opposed to a veneer one as being quite significant. The other retailer stocks only veneer boards and makes a point about how they do this to help protect the environment. I am not going to conduct any research into the carbon footprint of a veneer board over a solid one. However given that the said retailer has piles of stock air frighted over every month I doubt that saving the planet is their true reason behind their stock of veneer chess boards. In case you were wondering, a veneer chess board is constructed using a center slab of wood to which thin layers of wood are glued to each edge in order to give the board the appearance of being made using the layer wood, as opposed to the wood or material thats hiding inside. One benefit to this method is that a center core can be used that is 100% stable. MDF or ply wood wont bend or crack or move in different temperatures so using these for chess boards can make someones life much easier. 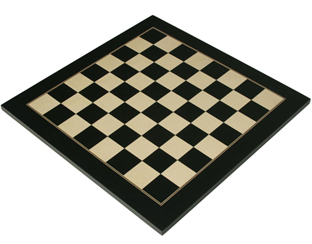 Of course no one would buy an MDF chess board, however cover it in a veneer of mahogany or maple and all of a sudden you have a decent looking chess board. While there is nothing wrong with this method the appeal of a board thats solid throughout is far greater. It almost seems less fake to have a solid board, it’s not pretending to be something it isn’t. If you have ever bought a cheap chopping board thats made from wood you will understand what can happen to a piece of solid wood. Sometimes is just naturally wants to bend like a banana. The production of solid wooden chess boards would suffer the same fate if it were not for expert selection, seasoning and crafting of these boards. You can begin to see why they cost more than their veneered cousins. There is also the subject of age to consider. While a veneer board might look great when it’s new can we expect it to fair so well after 20 years of use and the occasional meeting between a stone floor and it’s corners? A solid board is going to age gracefully and wear it’s knocks with pride while a veneer board is going to need plastic surgery and a helping of super glue to remain looking good into old age.